You may not notice at first glance, but Sandy Hook's Fort Hancock is, in many places, a study in uniformity and symmetry. With golden-hued brickface and green woodwork, most of its buildings share a common look, regardless of their size. Officers Row is organized so that the smaller lieutenants' houses are on the outer flanks, the intermediate-sized captains and majors near the middle, with the commanding officer's home standing as the largest building in the middle. good conduct medal outside Barracks 25. On the other side of the parade ground stand four much larger buildings: the barracks designed to house 70 enlisted men and a handful of non-commissioned officers each. Erected in the late 1890s as some of the fort's first 32 structures, the barracks were later supplemented with separate mess hall buildings, moving food prep to open up bunk space for an additional 38 soldiers. Today, one of the barracks is used by the New Jersey Marine Sciences Consortium, while the others remain unrestored and empty. Uniformity being a big thing with the military, there was nothing about the barracks' exteriors to distinguish them from each other. As alike as they appear, however, the northernmost one, Building 25, holds a special place in history. During World War II, it was home to the 70 female recruits of Fort Hancock's Women's Army Corps (WAC) detachment. Organized to fill administrative roles within the Army to free up male soldiers to go into combat, the WAC (originally the Women's Auxiliary Army Corps, or WAAC) was the first of the service corps to enlist women for the war effort. The concept met with resistance on several fronts, among them the manufacturers who needed women to work in defense plants, and clergy who felt that mixing the genders in the service would lead to morally questionable situations. Many WAC recruits enlisted despite the disapproval of their families, though others were pleasantly surprised to discover their parents were proud of their commitment to serve their country. Like their male Army counterparts, WACs were expected to be in general good health, but other physical requirements indicated that they were not going to be taking on jobs that required heavy labor or exertion. Eligible women were between the ages of 21 and 50, anywhere between five feet and six feet tall, and weighed between 105 and 200 pounds. The educational requirements for WACs exceeded those of Army recruits: women had to have earned a high school diploma, while men could enter the service without one. In reality, many had their college degrees, as well. What they all had in common -- men and women alike -- was a desire to do their part to defend the United States. 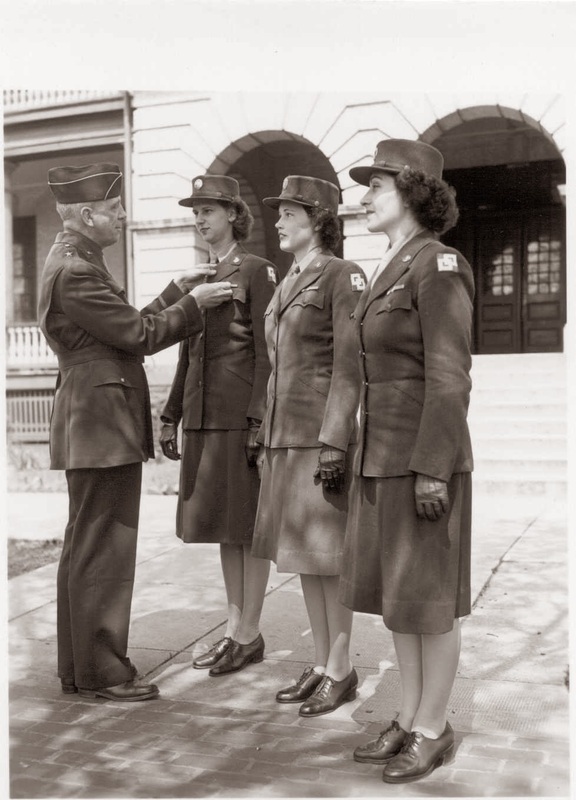 By June 1943, when the first seven WACs came to Fort Hancock, their "auxiliary" status had shifted, and the women were on the same rank and pay structure as their male counterparts. They were on Sandy Hook to support the 1225th Army Service Unit, Second Service Command, which provided administrative and logistical support to tactical commands. Thousands of male soldiers had already swelled the base's population to over 7000, but the women remained well outnumbered until the end of the war, with ranks of approximately 70 at their height. They fit comfortably (if anything in the Army could be "comfortable") into Building 25, which one WAC declared to be a "honey" of a place. Only small concessions were made for their gender: sheets, shower curtains, toilet stalls and a laundry. Well, that and the fact that the adjacent barracks was converted to post headquarters to conform with Army regulations requiring 150 feet separating mens' living quarters from womens'. Army leadership had envisioned WACs as a clerical force, but the women proved their mettle in more than 400 of the service's 625 occupation codes. Following an edict from Fort Hancock Commanding Officer Colonel J.C. Haw, women soldiers easily took on their assignments at the motor pool, commissary, finance office, post exchange and elsewhere around the base. Oral histories collected from Fort Hancock WAC veterans indicate that they were well accepted around the base, and aside from the usual bad apples one runs into in any job, their military experiences were positive. Like many of their male counterparts, some capitalized on the GI Bill to get their college degrees after the war, and some met their future husbands on the base. According to the National Park Service's historic structure report for Barracks 25, the WACs appear to have left Fort Hancock by the time the 1225th departed at the end of 1949, about six months before the base was deactivated. Maintenance records seem to reflect the WACs' return to Barracks 25 in 1955 to support the reconstituted 1225th, but their further history isn't clear. What the role of women was at the fort by the time of its decommissioning in 1974, well, that's a story for another day.